This Nemesis black rugged watch showcases a black dial with white hands and a rectangular-shaped, stainless steel case. 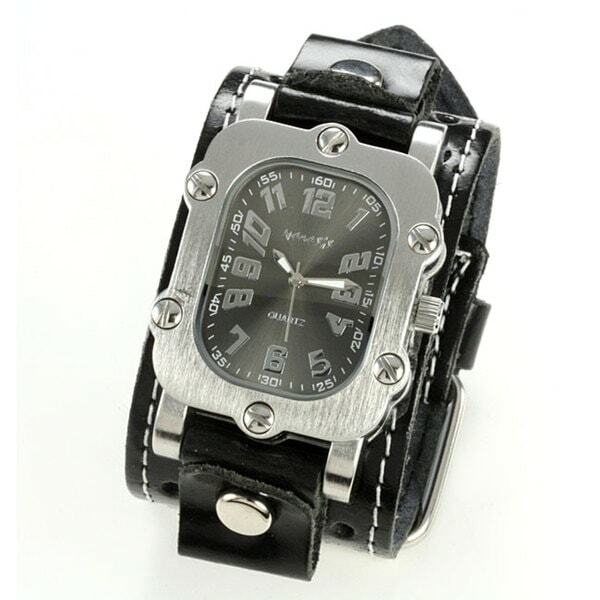 This Nemesis timepiece also features a black leather band with two silvertone buckles. This is a rugged,unique watch and I am quite happy with it.The leather strap is of good quality and the watch case is thick and heavy and appears to be well made.The watch keeps perfect time and is water resistant.I really like the unusual shape and look of the watch! I've purchased this watch for every male family member and they love it. Now I've been purchasing this watch for my dear friends as gifts. Bought this for my son for Christmas. He picked it out himself so I know he will love it. Bought the black its very handsome. I am very happy with the product.Actualy I order a second one in brown. A timepiece I am often asked about, it's a great addition to my watch collection! Great cool looking industrial/goth watch! Looks pretty much like the photo! I'm a bit concerned that the bands holding the watch in place is a bit thin since the watch is bulkier/heavier than usual, but no deal breaker. I love this watch! I wanted a tough watch that was not made of some type of plastic and looked good. This watch is heavy duty a solid hunk of steel. Looks great And I get compliments on it. I own many watches, so gifted this to a friend who was travelling through. The double fastener on the back drove me a little crazy. Hard to NOT notice this time piece; I tell friends it was made by the BIG*SS WATCH CO. Accurate and like luminous hands. works well with jeans. Rugged look. lot's of compliments. This was a gift for my husband, it is so cool and he loves it! I bought this for a gift for Christmas, and it looks really nice, I know he will love it. very attractive and solid , trulely real men watch , its eye catcher , it sure represent me . and based on other oweners its great quailty . cant wait to recieve it , and great deal.